Tom also was known to the fans of Tolkien's works for his illustrations that appeared in books and magazines. Here is one. He also made sculptures along the Hudson River from driftwood and other found objects. Tom was a partner in the Aulic Council board game company and co-designer for Mohawk, a game of the French and Indian War. He was one of the earliest game testers for Junta. Tom leaves behind his beloved wife Susan. Here are some pictures of his ACW line. First, the 54th Massachusetts and Colonel Shaw. Battle flag of the 16th North Carolina. Regimental flag of the 69th New York Volunteers "Irish Brigade". Very sad, my condolences to his family and friends. My sympathies to his family and friends. A creative talent gone too soon. Very sorry to hear that. Sincere condolences to his family and friends. Sculpted in molten wax, as were all of Tom's minis. RIP good sir. My condolences to family and friends. Deus Misereatur. Another of the Old Guard passes. Sad news indeed. 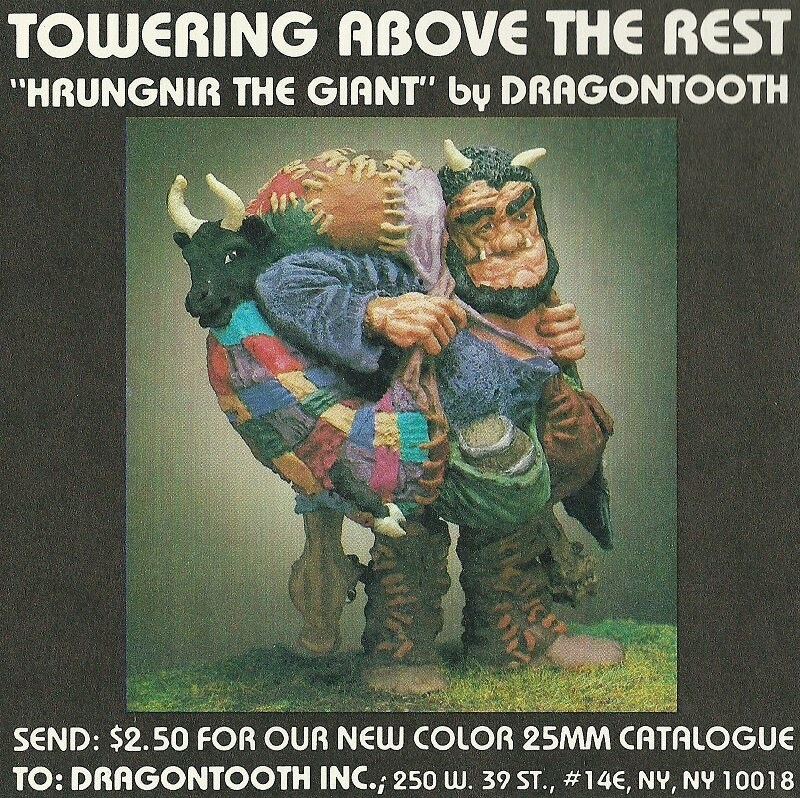 I remember Dragontooth miniatures very well. I still have some packed away somewhere. I didn't know that he was a "large scale" sculptor and illustrator also. Rest In Peace, Tom Loback. My condolences to his family and friends. I regret the Dragontooth line is not still in production – it would be a good memorial. I agree, SleepyDragon, but Tom didn't want to produce the miniatures any longer, and he wouldn't sell or lease the molds or masters to anyone else. His prerogative. I remember the first time I saw Tom was at an MFCA convention, his table was just down the row from mine and the gamers were 6 deep buying up his new Dragontooth line. He was a layback, nice guy and a true artist. My condolences to his family. Spent many early Gencons with he and Susan. Always the first booth I went to and the one I spent the most at every year. RIP. So sudden and unexpected. I have been collecting his Dragontooth lines for years and have been following his life antics via Facebook. So sad. Sorry about reviving this and it seems I'm late to find this sad news out about Tom but I wanted to add something about what kind of a person he was. The NYC group that wargamed at The Compleat Strategist waaaay back in the day was one of two clubs I started war-gaming with. I had been buying Dragontooth miniatures for years before meeting Tom because the other wargames group I started with in Westchester used oodles of his Saurians. We had fantasy games with Saurian pike phalanxes, mounted lizard knights and Dragons fighting dwarves, elves and fully armored Scottish pikemen on a huge sand covered table. Those were fun, fun games. In any case, I was just in Jr HS when I started gaming with Loback's crew He was something of a super star to me. He looked cool, he had this fabulous loft in lower Manhattan and he was a real artist. Even in those days, I knew he had it going on. And he was a gentleman. Some of the other older adults couldnt be bothered with me and were way too serious about winning the game. They would give me units to marshal during the game and then take them away a little bit later without asking. Tom always let me command a few units and would tell me what he wanted me to do and then let me (or help me) carry out the moves. That always made me feel like part of the group and I also felt like a real adult; trusted to carry out a task that could affect the game. Tom really never seemed to care whether he won or not which was a contrast to some of the shouting matches which erupted over rules interpretations. Some of which lasted hours! No, instead Tom just wanted to have a good time. And I admired him for that. Additionally several of the other members were anxious about me touching their mounted miniatures (many of them hideously deformed by poor paint jobs) whereas Tom ( and ironically the best painter in the group, Joe Miceli) would always let me handle the figures he painted or had professionally painted by Mike Gilbert (Another terrific man who taught me how to paint miniatures with casein paints) without a thought towards damage. Tom, when he found out I was a fan of his miniatures would sell them to me at pennies on the dollar. One time I had my knapsack so filled with lead that I literally got a back ache on the way home. He let me afford an army of Saurians which I had never in my wildest dreams thought I would own. During the many bellowing arguments members of the group would engage in and when I was not sent on errands to acquire snacks, I would check out his uber cool loft with it's romantically large windows. I definitely changed over to historical miniatures as a result of the campaign games they played moving from map to tabletop. Well when i went away to school, I lost touch with everyone but I still have fond memories of Tom being a fair minded, good sport. Thanks for the memory MiniPigs. You might enjoy reminiscing with other like-minded souls on our Old School Miniatures Facebook group. I didn't get to know him for long enough but always enjoyed our correspondence.